The bike lane we spotted at Fort Mason last week, which replaced a lane of car parking on the northern end of Van Ness Avenue, could be removed any day now, according to city staffers. The bike lane was installed temporarily as part of the People Plan, intended to encourage visitors to bicycle during the America’s Cup yacht races — but only on a trial basis. As a number of Streetsblog commenters noted, it was a refreshing surprise to see such a sensible project apparently go in without the fierce, drawn-out political battles that typically accompany parking removal. But it looks like this space will revert to car storage, and sharrows will be painted in the roadway instead. The bike lane was originally scheduled to be removed on November 1, said Adam Van de Water, project manager for the Office of Economic and Workforce Development. It’s unclear why the lane has lasted this long (best guess — it’s on the backlog for street painting crews). The lane “was designed as a pilot to provide safety, comfort and direction to cyclists transiting between [America’s Cup] venues with the long term legacy value of providing empirical data on its effectiveness given competing uses at the site and the desire to create a contiguous SF Bay Trail,” said Van de Water. I believe the consensus only a portion of cyclists used the cycle track with many opting for a quicker transit along the center of the roadway where the pavement is in better condition and where they are used to riding. As a result, SFMTA is adding new painted sharrows in the roadway when the temporary cycle track is removed. Any final decision rests with the NPS, said Van de Water. Barring a sudden intervention, the removal of the bike lane is impending. If you’d like to see it stay, the people to contact are Lynn Cullivan, community outreach manager for NPS, at lynn_cullivan@nps.gov; and the SFMTA Sustainable Streets Division at sustainable.streets@sfmta.com. Everyone I saw on that segment while passing by today used the protected way lane. I write to strongly encourage you to maintain the bike lane near Fort Mason on the North end of Van Ness Avenue in San Francisco. I have personally ridden in that bike lane numerous times (certainly no less than one dozen) since its installation for the America’s Cup this summer. The separated space is helpful for bike riders, especially the abundance of tourists riding to the Golden Gate Bridge, as well as local, leisure riders like myself, and keeps bikers from riding on the sidewalk. Most important, the reduced parking has a traffic calming effect on the dead end of Van Ness that is primarily used by people searching for free parking and creating unnecessary congestion for the SF Muni turn around one block south. There is ample parking in the Fisherman’s Wharf area without the negligible number of spaces removed for the bike lane (as confirmed via the public and private parking garages and relatively low cost dynamic meter pricing via the federally-funded SFpark program). Furthermore, the free curbside spaces that were removed may have actually harmed the purposes of SFpark by encouraging individuals to cruise for free parking while metered and structured spaces were made available via SFpark. Finally, in anticipation of the future expansion of F-line streetcar service through the Fort Mason tunnel, as promoted by the Park Service, it would be detrimental to encourage drivers to cruise for parking across the streetcar tracks by removing pleasant, active-transportation focused infrastructure. Accordingly, please ensure that the Park Service in conjunction with the Sustainable Streets Division of the SFMTA, retain and enhance the separated bikeway at the North End of Van Ness Avenue to support the federally-funded SFpark program, plan for the future, and promote active transportation like biking and walking in our National Recreation Areas. 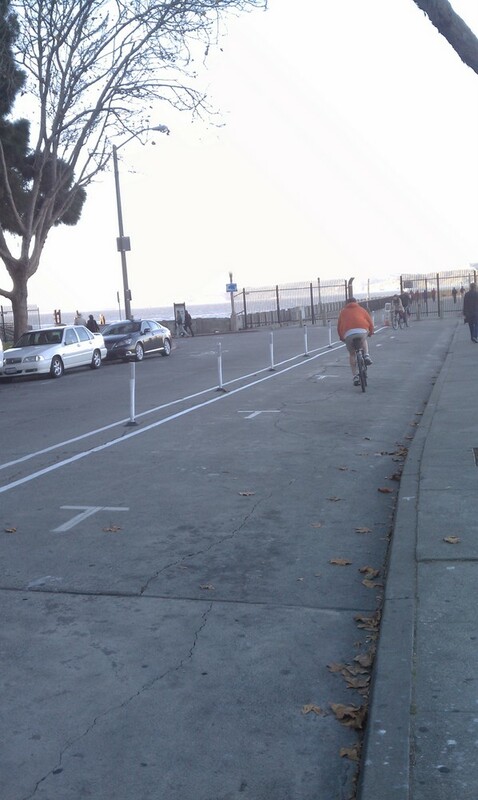 Thanks Aaron for highlighting our pilot cycle track on Van Ness during the America’s Cup. I wouldn’t say that the lane “isn’t worth keeping”. On the contrary, as a cyclist myself, I support projects that improve bicycle and pedestrian safety, particularly in heavily used corridors like Aquatic Park. Making the cycle track permanent would require a broader public process led by NPS that considers not only the final location of the cycle track but how people access it from the west, how it aligns with a future extension of the historic streetcar, what impacts the removal of parking has and how it integrates with some planned improvements to the promenade. It’s a conversation the City welcomes. This morning I saw a crew out with some kind of torch, I guess that is the removal process. I can’t imagine the perceived value of parking there, and as another commenter said, cyclists I have seen have adapted to use this. It was only in place for a few weeks, how can people be expected to adapt so quickly? It’s a real hazard when cars are parked along here and constantly turning around at the end. Even if the infrastructure was a good option for the long term, which is might well be, sidestepping the normal processes that go with modifying the physical layout of a street and reducing parking just because a temporary short-term facility was built is not acceptable. How would cyclists feel if a bike lane was termporarily removed for – say – roadworks, and then they decided that since it has been removed for 2 months it should stay removed forever. There is a proper way to put such infrastructure in place as a permanent facility. This process should be respected. This happens every day when a driver double parks in a bike lane. And don’t give me that high and mighty “the process should be respected” crap. No one is disrespecting the process but obviously this was a popular improvement for very litte driver sacrifice, a solution can and should be found. The problem is that this improvement was done on a temporary basis, therefore bypassing the normal decision bodies that street modifications needs to pass. An appropriate comparison would be: a bike lane is closed for 6 weeks while they do heavy utility replacement works, to allow for truck traffic to/from the construction site. After the project ended, truckers like the new road which casually connects to a larger warehouse, and demand it stays that way. You are advocating a “Trojan Horse” likely illegal move: something was done temporarily, only for an event, then a backlog of works postponed its removal a few weeks, now you want to make it definitive just be cause it works. No, it shouldn’t happen, and people who try to do things that way (public officials, if there were some pushing for it) should be sued the heck out of their offices. Mind you: I’m not saying a protected bike lane should or shouldn’t be there. That is beyond the point: a temporary installation cannot be converted into something definitive just as a way to bypass the law (where its opponents will have time to voice their concerns, valid or not). “Likely illegal”….wow, do you not know what you’re talking about. Whereas Adam Van de Water has commented to the effect that there needs to be a process for NPS approval, you’re just making baseless devil’s-advocate arguments for the sake of making your mark on SF Streetsblog. Seriously, just go away unless you have some specific San Francisco-oriented insights. And further, I’m wondering if you’ve even been to San Francisco….Are you aware that this is a section of town that’s not a major artery for motor vehicles but could be a vital connection for other modes of transit? Finally, stop with the false analogies, please. One mode of transit is not interchangeable with another. The Europeans know this, and now major U.S. cities are finally understanding this too. And if you’re so keen for the analogy making, know that cyclists and pedestrians for decades have endured cities widening roads for the sake of ‘progress,’ only to have these roads going past their homes turn into traffic-choked death traps. So excuse us while we’re not interested in making improvements in some so-called equitable manner.